So NOTHING eats it. Rabbits, deer, mice, deermice, giraffes... Nope. This lovely cousin is the anchor of my first and puny crevice garden. It's basically the same size as the garden. Which is good, becasue it looks awesome absolutely 13 months of the year. 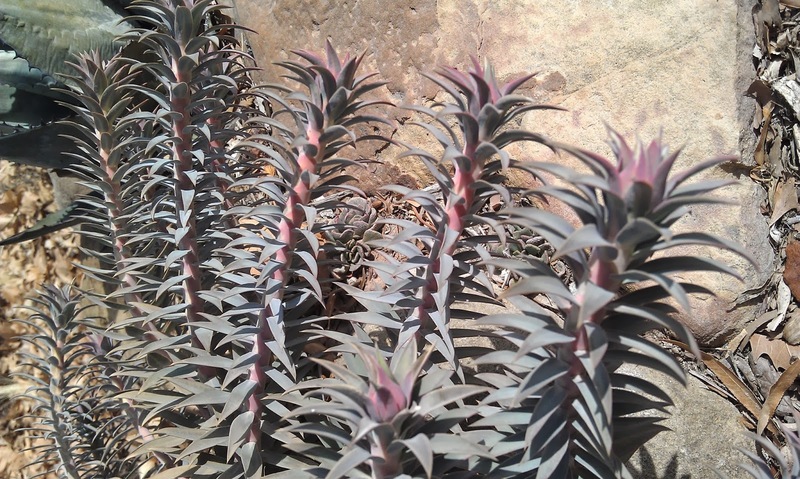 In fact, Euphoribia was quite decorative in the -15F (-25C) realm last winter just days before the cold would turn that Havard's Agave into jelly. This spurge is tough. In spring, the flower buds glow cooly. The ruddy flowers give way quickly to seedpods. This year, I discovered why its progeny were on such distant corners of the garden: While planting nearby, I kept feeling pricks against my cheek. Finally, I realised that the air-filled fruit become pressurised by the sun and explode their seed to distant places! Just when the tired bloomed-out stems of this year finish, A new set of spiny octopus arms has already emerged to replace them looking oceanically regal. A mass planting of this would look great near a schwanky new building, like so much brushed steel. BUT- and this is a big but- It is reseeding about the garden, and looking quite nice in form in the dryest and even shadiest of places. Which at once pleases me and scares me. I am watching you, oh Mediterranean Spurge. If you are not the next horrendous weed, you are the prettiest dang thing. Underappreciation Files #5: Night Phloxes. Well, they may not strictly be night-bloomers. And they are close, but not really phloxes. 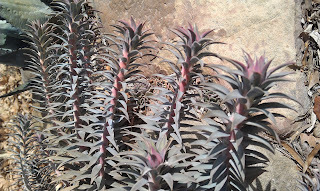 Call them "Prickly Phloxes" or scientifically (don't be afraid!) "Leptodactylon," which, if it helps, means "skinny fingers," which is a reference to the leaves, which individually look like a hand of slender pointy fingers. For the scientifically/taxonomically inclined, it looks like most species of these (save for L. californicum) have been re-assigned "Linanthus." Whatever. They are all from the dry American West, and rarely grown in gardens. There are perhaps half a dozen species, so by numbers it's easy to "collect them all," but by their horticultural scarcity and requirement of a dry garden to prosper, not so easy. But they are totally worth it, three inches of pure joy. Leptodactylon (Linanthus) watsonii. Sold by Aguafria Nursery, I think. Being shy in daytime with its dark-rimmed night-flowers. Look closely and see how the leaves are not single needles as much as a set of needly lobes. Leptodactylon (Linanthus) pungens, with characteristic "ropey" habit of stems, blooming this spring, not as shy in the daylight, in Rabbit Valley, far Western Colorado. Another fine plant for the parched and dry unwatered rockery. If you are a collector, grow it! If you are not, find out how!